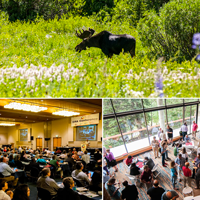 The 2016 CRA Snowbird conference kicked-off with a plenary conversation between John Markoff, the Pulitzer Prize-winning journalist who covers science and technology for The New York Times, and University of Washington professor Ed Lazowska. Panel sessions included topics ranging from Smart Cities to computing’s place in the university to the future of work. A major focus of the conference was booming enrollments, with a short plenary followed by parallel sessions devoted to the topic, its various ramifications, and ideas to help you deal with it, including best practices for managing growth. The meeting also featured a view into computing and Washington from CRA’s Government Affairs Director Peter Harsha, and short after-dinner talks on computing research futures organized by the CCC. New this year, we facilitated book and article discussion groups over coffee on Tuesday morning. In addition to the conference, a workshop for new department chairs was held on July 17. There was several hours of free time for networking and enjoying the gorgeous environment. This workshop will introduce new CS department chairs to some of the skills that they need to lead their organizations and to work with deans, provosts, and advisory boards—i.e., the stuff they never taught you in graduate school. John Markoff has been a technology journalist, a student of technology, and a confidant of leading technology insiders for 40 years. In addition to his reporting for the New York Times (and previously for The San Francisco Examiner, Byte Magazine, and Infoworld), Markoff is the author of a half-dozen books, including Cyberpunk: Outlaws and Hackers on the Computer Frontier (1991, with Katie Hafner), What the Dormouse Said: How the 60s Counterculture Shaped the Personal Computer Industry (2005), and Machines of Loving Grace: The Quest for Common Ground Between Humans and Robots (2015). The topic of the latter book—artificial intelligence and human values—is a particular current interest. Markoff is at his best when conversing about topics that draw upon his broad and deep knowledge of technology and the personalities that shape it. Ed Lazowska will engage Markoff in such a conversation, with plenty of time for attendees to pose questions. Disney Research is an international network of research labs, with the mission to push the scientific and technological forefront of innovation at The Walt Disney Company, with labs colocated with universities in Los Angeles, Pittsburgh, and Zurich. Google Pittsburgh has grown from two employees in 2006 to many hundreds of systems, algorithms and machine learning engineers working on the very heart of the company’s technology stack. Through stories of the growth of corporate lab culture in Pittsburgh over the past decade, I would like to discuss some perspectives on the big wins, the big pitfalls, and the lessons learned while dozens of global companies have commenced research and engineering organizations close to CMU’s School of Computer Science. I would like to end the talk with a full joint discussion of tips and tricks we can share amongst each other for optimizing these kinds of partnerships on behalf of the students, the faculty, the local economy and the companies. (Note that a similar talk was due to have been given by Jessica Hodgins, Professor at CMU Robotics Institute and VP at Disney. With great regret, she has suddenly needed to withdraw due to a family emergency. I’m no Jessica, and the slides will be a little hasty, but I’m hoping for a spirited session with useful takeaways for all of us). The brief plenary will be followed by breakouts into parallel tracks. “Booming enrollments” is on the minds of many CS faculty. In this session, the panelists will share details on what has been learned recently via two CRA surveys (one to departments, one to students), present the status of a National Academies committee on the growth of computer science undergraduate enrollments, and introduce the parallel breakout sessions. During growing enrollments, CS departments need to find ways to provide enriching and challenging experiences for top students. Honors programs, undergraduate research, specialized leadership experiences, and five-year B.S. and M.S. programs can engage such students and give them high-quality experiences that make them competitive for future graduate school and fellowships. Who are the students in our growing CS programs? What are their motivations for taking computing courses? How are changes to computing degree programs affecting the profiles of students in our courses? How are best practices in increasing diversity being adapted during this period of enrollment growth? How are CS departments managing the current increases in CS enrollments? What actions are departments taking to meet their demand? What activities are they forgoing or reducing to compensate for the resources needed to meet the growing demand? What are the likely long-term consequences of these practices? Today, communities across the nation face a set of deeply interlocking physical, social, economic, and infrastructural challenges. By collaborating at the intersection of computing, engineering, and public policy, private and public-sector stakeholders are finding innovative solutions to the evolving needs of our cities—from enhanced delivery of city services to increased resiliency and efficiency of urban infrastructure and more sustainable environments. This digitization of the urban environment holds the potential to unlock transformational progress in key areas, including health and wellness, energy efficiency, building automation, transportation, and public safety. This session will discuss the potential to bring interdisciplinary university researchers together with civic leaders and an engaged citizenry to build the smart and connected communities of the future—with a focus on the catalytic role of computing, information science, and engineering. This session will explore the growth and impact of activities for computing students that operate outside the usual classes and degree programs. These extracurricular temptations include hackathons and competitions where students may invest intense effort over short periods of time for rewards that may include fame and fortune. The panelists will discuss how universities can and should support these activities for the benefit of students and overall educational goals. What are some of the major research questions in CER? What computer science research is driving CER and how can CER advance computer science research? What are the benefits to a CS Department for having CER research programs? How can CER advance teaching, diversity, and assessment? Computing research continues to be at the forefront of innovation, impacting society in ways never before imagined. In this session, speakers will discuss these new impacts and what the future might hold. As technology reaches increasingly deeper into our everyday lives, changing the fabric of society woven by our interactions with fellow citizens, government, and the corporate world, design decisions have an increasing impact on basic social values such as privacy, fairness, and protection from physical and emotional harm. Complexity of this type requires mathematically rigorous notions that allow us to quantify these goods and their loss, explore fundamental tradeoffs and limitations, and lay the theoretical groundwork for what can be achieved. This talk will describe relevant efforts in privacy-preserving data analysis and fairness in classification, and discuss an agenda for future directions. Computing Alone Doesn’t Solve Social Problems. So, What Next? In spite of the do-gooder rhetoric of Silicon Valley, it’s no secret that computing technology in and of itself cannot solve systemic social problems. Even after a golden age of digital innovation, poverty persists, economic inequality is rising, and politics is more polarized than ever. Given this, what should computer scientists do if they want to genuinely contribute to a better world? This talk offers suggestions for computing researchers and educators. Lately, the interdisciplinary area of data science has recently received an enormous amount of attention. The use of analytics to extract information from small or large amounts of heterogeneous data, in order to inform decision-making, is a hot topic in a broad set of areas such as policy, science, and business. What is data science and what is its relation to computer science? What do students have to learn about data science to become practitioners? Should learning data science require technical skills and, if so, what is the minimum skill set? What are the big research questions in data science? Many members of our community currently feel the need for an authoritative ranking of CS departments in North America. Should CRA or another organization be involved in creating a ranking? To inform such discussions, the speakers will explain what is involved in creating an authoritative ranking. We will hear about the U.K. ranking, which dictates resource allocation to CS departments in the U.K., and about the U.S. News & World Report ranking, which became popular after the National Research Council’s exit from the field. We will also survey some of the issues connected with creating or not creating an authoritative ranking. New technologies have brought biology into the spotlight and opened up novel opportunities to program, design, engineer, and communicate with biological components. Programming and engineering give computer scientists the ability to not only understand the complexity of these biological components but to also take advantage of them in order to create new functions, applications, and novel interfaces, all of which are enabled by technology but driven by nature. In this panel, the speakers will explore the new opportunities enabled by combining engineering, computer science, and biology, and will present research examples using programmable materials, data storage in DNA, obfuscation and encryption in vivo, and tools for biological circuits. The speakers hope to encourage discussion and inspiration around these biologically inspired research projects. As computing continues to grow by tremendous leaps and bounds and permeate throughout the university’s intellectual landscape, many department chairs are finding their programs have outgrown, or are outgrowing, the confines of their current locations in colleges of engineering or science. Discussions are taking place in many departments about exploring the possibility of expanding to a school or college of computing (or a similar related name). This panel will explore the multifold administrative, social, strategic, and economic challenges confronting departments that want to become schools or colleges of computing. Following short presentations by the panel members of their insights, the panel will discuss the challenges of, and the strategies for, transforming a department into a school or college of computing. This session will focus on the potential impact of computing technology on employment and the nature of work over the coming years. Panelists will suggest the advances in artificial intelligence, robotics, and automation that they believe are possible and the impact these advances may have on employment. The panel will include a discussion with the audience about likely trends, government policy debates that may arise as a result, and the role computing researchers can play in helping assure these debates are well-informed. For five decades, Moore’s law has allowed the computer industry to achieve increasingly capable and high-performance hardware and software with each new semiconductor generation. These scaling trends have underpinned most of the revolutionary computing breakthroughs of the past 50 years. Now, however, scaling trends are slowing due to both physical limits in fabricating ever-smaller transistors and to power dissipation limits in using them. Increasingly, computing hardware researchers and manufacturers are planning for the post-Moore’s law era. There is no silver bullet; the solution will require fundamental changes at all levels of the computing stack. In this panel, the speakers will lead a discussion about why all of computer science will be affected by these changes and how departments should be planning for, and reacting to, this development. Uncertainty with the political process is always a problem for those concerned with federal investments in research, but 2016 promises to be even more uncertain than usual. Highly contentious presidential campaigns, heated congressional races, a deeply polarized Congress, exceptional scrutiny of federal investments in research, and who-knows-what-else that will emerge in the months ahead will likely impact the level of federal spending on science. To start the discussion, CRA’s Peter Harsha will attempt to make sense of this seemingly chaotic political landscape and discuss how and why CRA and CRA’s partners in the science advocacy community are navigating the terrain to support the computing research community’s interests. Next, a panel will discuss research-funding realities given the imminent increases in faculty size, where and whether additional funding might be found, and promotion and tenure criteria if research funding becomes scarce. This session will begin with a reception, which will be followed by a panel discussion. The national Computer Science for All initiative aims to make great CS available to students in every K-12 school. It’s an audacious goal as any one who’s worked in a school can tell you. Yet, Computer Science for All has gained tremendous momentum, with participation from federal agencies, states, school districts, and private organizations, including ACM, Code.org, the Computer Science Teacher’s Association, NCWIT, and Teach for America. This session will provide the opportunity to talk with faculty from leading CS departments about how they are supporting Computer Science for All. The speakers will discuss their experiences launching the new AP CS Principles course, supporting research on CS education, providing professional development for local teachers, working across districts and states to create CS pathways, broadening participation across the pipeline, and involving undergraduates in K-12 with service-learning projects.